I really like going to the gym. The gym I currently go to is Avenue Tennis Club in Gillingham Kent. It’s a superb gym. Clean – exceptionally clean. Safe, with controlled access. A restaurant and numerous social scenes laid on on throughout the year. It has as you would imagine a very unique Tennis Club attached. It is a great club. Yet as I write this blog, the concept of gym sport remains as bleak to this club as it does to the Industry that has always had the infrastructure to support its own sport. I know it sounds like a broken record, but I still can’t understand the reluctance of gyms to create a sport from their training programs they provide to their members. 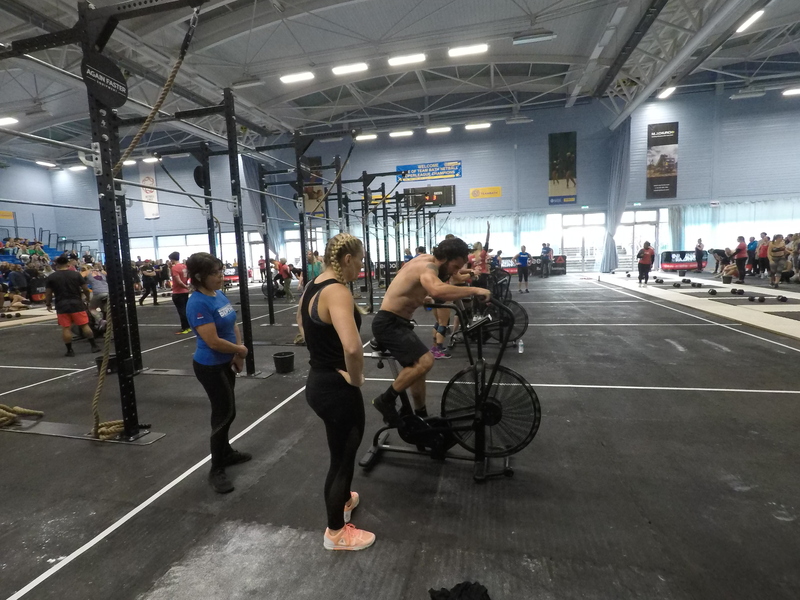 I can only say that its worked pretty well for CrossFit – they have nailed the concept of their own sport and are now seeking Olympic participation through the event programs that are happening currently. So as I train in the gym most days I have to conclude yet again that the division between performance sports in gyms and that of CrossFit is as wide as the Grand Canyon and for several years the experience that is so relished and loved by CrossFit members will still it seems take an age to come trough to the gym side of life. But make no mistake on this, the level of fitness that CrossFit athletes compete is insanely higher than that of your average gym member. These guys and ladies and freakishly fit and take their training to the absolute limits of physical and mental endurance in their environment. And that is the Ultimate statement – their environment , the training, they do , the weights they do and the day to exercise programs they carry out. They are masters of their sport and rightly so. But that does not mean it can’t happen in a gym. Forget copying the style of CrossFit that is just pointless. You can’t. It’s their domain. But what you can do is create the concept of Gym Sport . Its a starting program into pushing boundaries of your own training and then some. It’s getting a taste of performance. It’s starting to accept that your body has limitations and that you can be defeated by age or lack of experience, but also experience and age can be factors into being a formidable athlete too. The concept of a gym challenge in your gym is still a million miles away in reality. Gym members as a whole are just not fit enough to engage at the highest level , but as with all good sports they are ready to be trained and take on being pushed if given the chance. How do you create a sport in your gyms ? Simply put you can’t. There are a million apps out there that allow to go online and do something that will give a taste of training but as a whole the app scene is not a sport. The raw element of actually training cannot be replicated on your mobile device – the pain you experience can not be translated into a phone. Your hour or so in the gym is the most precious time you can have, this is where you break sweat and push your self and after , when you are warming down, stretching or just taking some deep breaths, it is not the phone that got you trough it , but you. An app is a great accessory but it cannot replicate the intensity of the workout. The workout is where the sport factor comes in , when you ask yourself what are you actually training for ? Think about it , when was the last time you walked into a gym and trained for something specific. I’m not talking about rowing the Thames over a week , or cycling 1000 miles over a period of time, but something you had to actually train for? If like me you still have yet to find a gym that will put this on the cards, then you can only do what you can yourself. But that in no way fills the void in comparative fitness, where you need to know the levels of fitness that can be achieved. That is not ego or bragging – that is not saying look at me. Look at what I can do . It’s taking the time to study and reflect on what is possible. It’s about finding someone of equal fitness , a potential training partner a friendly rival to compete against. It’s about looking forward to an event where the entire gym set on structured levels of fitness can take part and revel in the joy of competing and looking at their own levels of fitness and where they can improve. This is what gym sport does and for some reason. Something I have yet to fathom out. This is what is denied the average gym member and you have to ask yourself why in an Industry that is worth billions $ in the US, Europe and Asia . Can we ever expect to see a sport for gyms? Yes , certainly we can. I’m not too sure when. But the fitness world is catching up and seeing the benefits of the consumer experience in a gym. Something that was once mundane and boring is yesterdays market. The new energetic phase is slowly filtering through , and surely there will be a day , that a gym member will walk through a gym door and look at a sport they he or she can take part in. It’s not today , but it will happen – I just don’t know when. 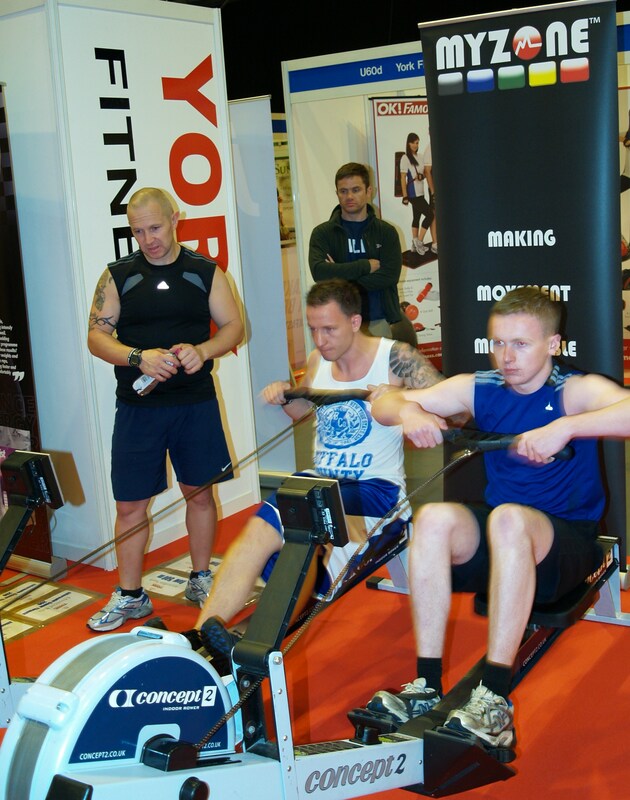 Gym Sport – World Gym Challenge – March Gym Challenge announced. Taking on the Rower, Treadmill and Chest to floor Burpees. The 1 minute recovery serves two purposes. One , it is a recovery between the rower and the treadmill, and Two, the recovery acts also as a transition between the rower and the treadmill for those who may have a small distance to travel. Also with these three challenges all three can be attempted by any level of Gym Athlete. 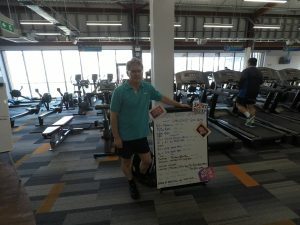 Author adminPosted on 01/03/2019 Categories NewsLeave a comment on Gym Sport – World Gym Challenge – March Gym Challenge announced. 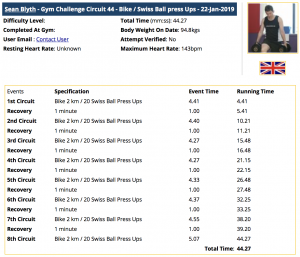 World Gym Challenge – Does your gym compete ? Gym Challenges are notoriously variable in their construction yet share the same trait as this simple formula Exercise X Time / Athlete < that is it. The Exercise can be variable in its duration, repetition, weight, distance or function. But once it’s been created only the Athlete is there to determine its finality of time. 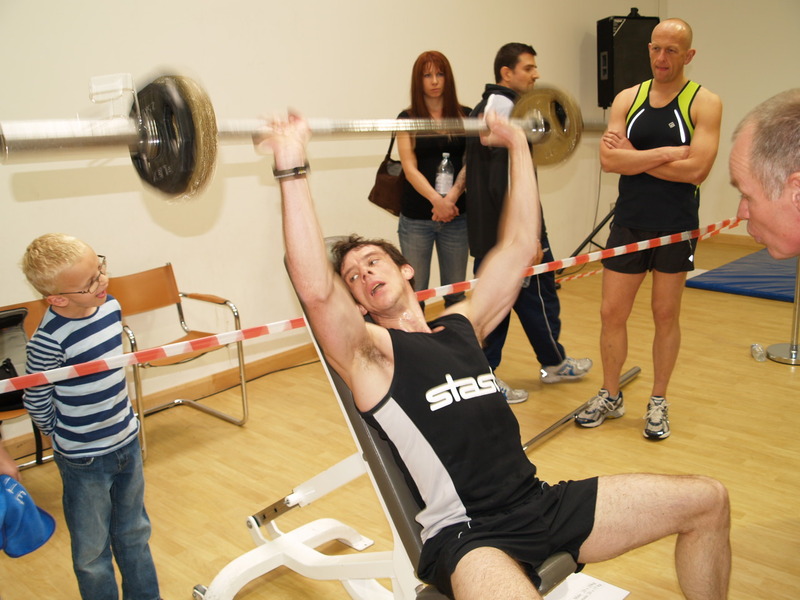 In this we see the evidence of just how your training is going in a gym environment. Yet the modern gym seems to function in a different entity and for some reason will not not adapt to a challenge that is based on performance. A recent gym challenge for members was to see how many classes they can attend in a month. Different classes, biking classes, pilates, HIIT etc , do as many classes as you can within a month, and by the amount you attend , will determine the winner , with various prizes offered by the gym for the winner. Another type of challenge is to see how many kilometres you can cycle with a 14 day period. I struggle constantly to be amazed at just how lacking the ingenuity of creating performance based challenges for gym members is, and how gyms refuse to implicate them. But then again do gyms have a point ? Is the member of a gym ready for gym challenges that are performance based? And the answer is no. 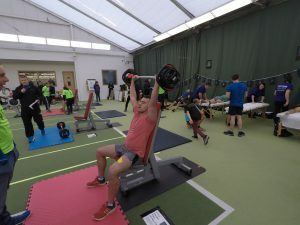 Last year during Sport Relief 2018, I tried to initiate some simple gym challenges at the gym I trained at with about a weeks notification to members and here we find the perfect combination of a heavily publicised media related Day (Sport Relief) a common cause and some good short sharp challenges over two days. The gym management and all personal trainers at the gym were too busy to get involved and where their objectives rely on revenue for their salary and profit , then its easy to understand why they didn’t. Yet the ability to encourage participation was where the fault expanded from. If you ask a member of a gym to take part in a performance related challenge in a gym, this it seems goes totally against their understanding of physical fitness and you are almost challenging their own beliefs into their own level of fitness and they do not have the confidence to perform as they are unsure of just how fit they are , and they feel they will be either intimidated by others or embarrassed by their result. You see, this is why gyms do not allow for the performance factor based on results. Why try to maybe intimidate a member by asking them perform on something they cannot do because they do not have the mindset to attempt it in the first place. So I get it . I understand the logic in not setting gym challenges which are performance based , its too much hassle , too much time, and the gym member will hardly ever commit to the level of training required to perform. And thats not to mention , the disruption caused during its set up and the need to recruit other members in the set up of recording results , judging or running with admin duties. Do a gym challenge based on Performance not routine and see how it affects those who take part. But … And there is always a but. On more then one occasion I have witnessed just what happened when these barriers are taken on and a successful gym challenge happens and the members who take part just experience (many for the first time) a real sense of achieving great results based on the the training they are currently doing. And the overriding reaction has always been , when is the next one? For clarification – This post does not refer to any Performance Based Gym Sport, such as CrossFit®. 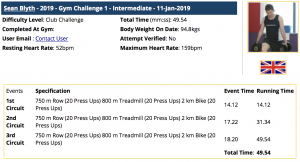 Author adminPosted on 27/01/2019 27/01/2019 Categories NewsLeave a comment on World Gym Challenge – Does your gym compete ? The most important part in any challenge is belief in what you can do. As soon as the mind thinks you can’t do it, then the body normally follows. This is relevant to any gym challenge, only it differs slightly. Firstly you have to have the mindset that you want to do it. Secondly you have to train for it. Thirdly you have to complete it. So in effect it is a three stage Challenge . On completion you will have a sense of pride that you completed the challenge and you also completed the training for it . But what is more important is that you are creating a habit. You are developing the mind set to engage in being challenged so that in the end you will need to see progress and development. Once that has been achieved a certain sense of pride within yourself for completing all the stages there is to a gym challenge allows the mind and body to prepare for the next one. This is probably why I have remained a member of a gym for over 25 years – the need to challenge myself. Ideally it would be better set for me to challenge somebody of equal fitness to me, but currently the gyms are just not ready for this. Allows you to have some support for the core but also makes you engage the core as you progress the numbers. I have found that reaching 20 is just about the right number as muscle fatigue in the later stages builds up at around 15 reps. So I am pushing through the final reps with a mindset of competing them all without resting the body. Even if it means remaining in the upright position for added core work. Technogym Bike , with a rpm of between 95 – 105 in a consistent format. Finishing in a time of around 3.45 is suitable . 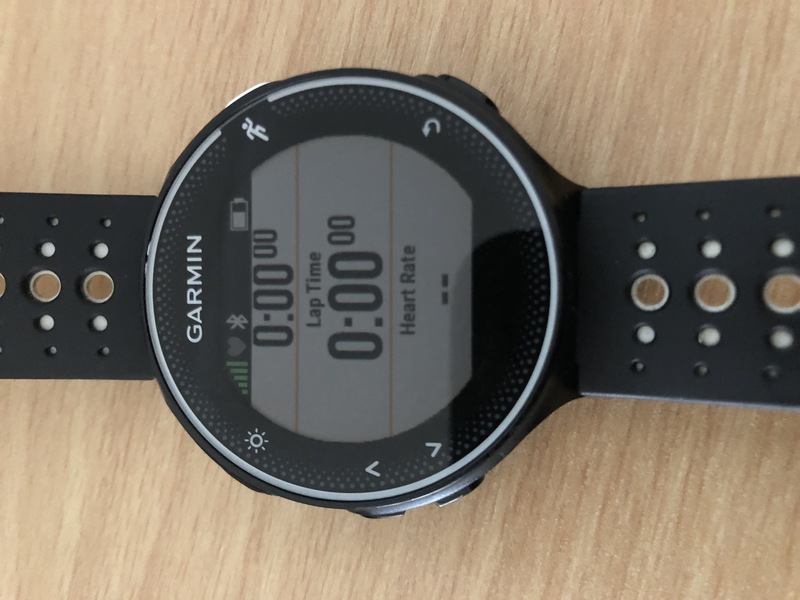 The heart rate will remain relatively constant at around 137 bpm at this tempo , which should mean that you are in a strong position to continue on to the further stages without tiring and needing rest. Today’s Circuit was completed with the intention to complete 10 rounds, but I found 8 I had had enough and listened to a sense of caution as my splits were slowing down. And I was reaching mental and physical fatigue – or was I ? In reality I probably could have carried on at around the same tempo under pressure in a race format , but the thought of having done enough for the day , was enough for me to quit training. After all , there is always tomorrow . There was a slight watch malfunction on this challenge which has been accounted for in the splits. During this month’s challenge you should be looking for consistent splits to achieve your best time. You will notice that at the beginning of the month, the splits I was producing were quite variable and my mindset was filled with self doubt because I was uncertain of just how far I could push myself. Remember there is nobody in my Gym prepared to take on the monthly challenges , so this is all self propelled. I have a heart rate monitor to keep an eye on my heart rate and the feeling of previous attempts to keep me on track and thats it. Always going to be where some good time can be made up , however for me, I think effort and actual time will decrease my time overall,. 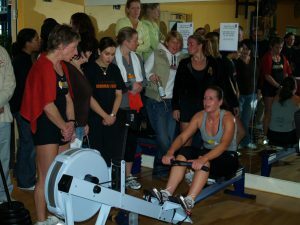 Rowing fast and hard if you are not fit enough will definitely increase fatigue for the later stages, so for me a relative pace would be more beneficial. Im looking for an even flow at around 30 spm with a 500m split of around 2.05 / 2.15 . Again its consistency with a level 8 (30% of max level Technogym Bike) , so rpms are quick at around 95 to 100 , which brings me in around the 3.50 – 3.55 mark. To engage the core more I have been using the smallest Swiss Ball in the gym to give me an uneven surface to keep my core engaged throughout the press up. My shins (nearest my feet rested on top of the Swiss Ball) On top of this my chest has been hitting the floor to go for a more consistent and uniformed press up. I think they are easier to perform , yet they still give you a certain confidence to perform the press ups in one go , which helps with the mind set when attempting the challenge at a later date . Having the confidence to maintain the speed at what you know you can do without the heart rate spiking and forcing you to slow down. The actual time of the treadmill after set up process is around 4.28 at 11 kph. So as a mind set you know that you have around a 4.30 run, yet can you increase that speed ?12 kph would I reckon be my max out pace. But it may tip me over the edge also. As you can see with consistent attempts the end result time has decreased. It remains to be seen if the Swiss Ball feet has been too much of an advantage with normal press ups . But I am currently heading for a quicker time of 4.49 from my first attempt. This is not to say that that time wasn’t possible from the start date – but what it is to say that building up your mindset in this process of training over the month will allow you to make decisions during your workout that allow you to perform better. What remains to be seen is if the 12 kph (800m) run can be maintained on the final day of this challenge. As this is where the time will be made up and if that will drain the performance of the press ups? 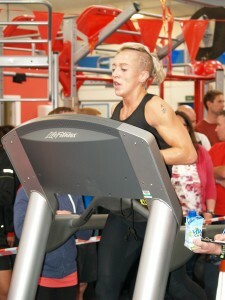 Intermediate Gym Athlete taking on the World Gym Challenge January Gym Challenge . It is vital to differentiate between current physical activities and sports programs in the gym that may be in circulation at the moment so that an identity and purpose can be preserved and the vision of WGC is not distorted. 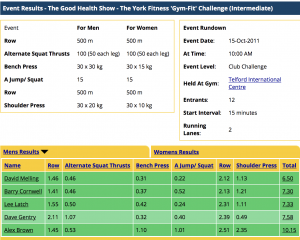 World Gym Challenge is nothing more than a database to record results for Gym Challenges , that are conducted in a gym environment. All results are recorded, so that in training or during an event a history of benchmarking can be maintained throughout your training and any event you enter. The actual events themselves are designed by individuals who have the experience to choose to create events based on their knowledge of past events they have taken part in or elements of training they can piece together to create a suitable race that will involve a number of set physical challenges. 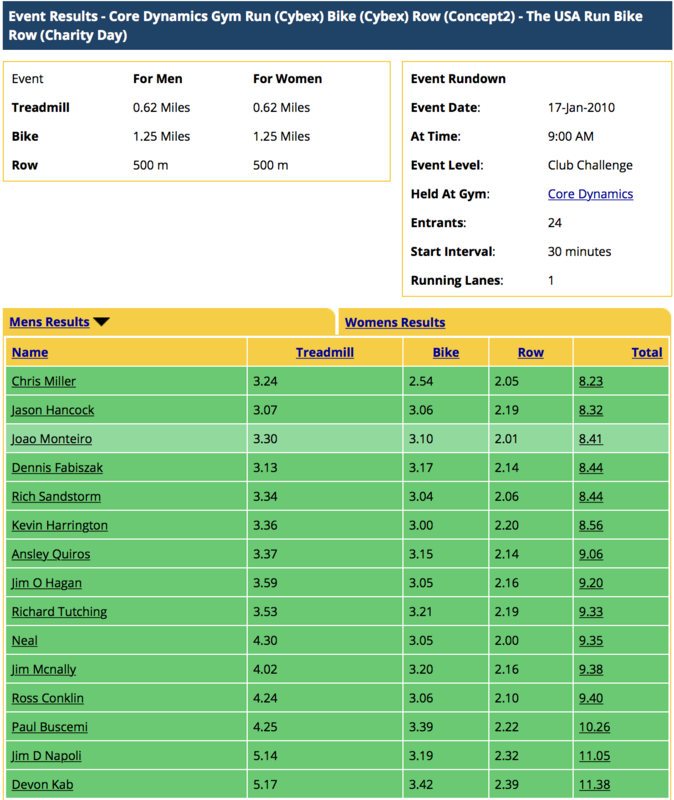 So far , that is what is out there currently in various formats, but WGC , centres and focuses on recording the split timing of events and giving a complete breakdown of individual timings throughout the race. Not only that it is focused on managing the correct fitness level of each athlete that takes part to ensure they race in what we call Equal Fitness Racing. This can only be conducted through time trials before the race and having finish times that are roughly the same. 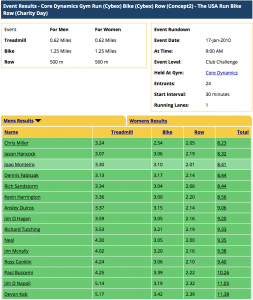 Equal Fitness Racing is then consequence of anybody of any fitness level being able to race in their category of Beginner – Intermediate or Advanced Gym Athlete. In this way the gym opens its doors to every single member in being able to race somebody who is roughly the same level of fitness as themselves. Individuals will race somebody who is matched to them, and this means in their field they are racing somebody ,who in theory is as much an elite athlete racing an athlete because the body can only be pushed so far and we are not all created equal. 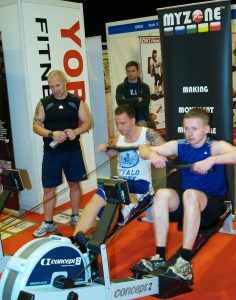 Equal Fitness Racing is the cornerstone fundamental practice of World Gym Challenge allowing anybody of any fitness level to race somebody in their gym of equal fitness. The January Gym Challenge has commenced and we are looking at fatigue during this challenge. You will (depending on fitness levels)succumb to fatigue. Fatigue will prevail in challenging your mental and physical strength and overall fitness. This is why WGC will not really be on board with say lets do 1 press up on Jan first and then 31 on Jan 31 – We kinda say , step up to the mark and manage your own fatigue because on some days you will nail it and others you will just not be able to increase your performance. As you can see the first and last split vary , which means your fitness levels are deteriorating and this is a good bench mark to find out your fitness levels . The sprint version is a good indicator of potential times, but 2nd and 3rd splits, will vary as the walk back to the row in your gym will add on time, so mainly we are looking at 2nd and 3rd split and fatigue. This is the Intermediate version so only 3 rounds and moving on Advanced with completing five rounds you will see little movement from the very best best athletes in the UK as their fitness levels show the huge differential in performance. We are not all the same and its not until you look at the time variables , you actually realise , just how the fitness levels in the UK differ. Having said that the WGC Challenge is something of a puzzle – if at any stage you out perform on one part of the circuit you may impair your performance at later stages. When looking at the press ups – there is a variable of 1.03 seconds from fastest to slowest. So in theory if I increased my running time , would it impair the press ups even more ? Its an eternal puzzle to sort out and the only way you can figure it out is to try the challenge over the month. Either way this is 50 minutes (lower intermediate time) in the gym, being focused and motivated and achieving something at the end of it all. Sub 40 would be upper Intermediate. 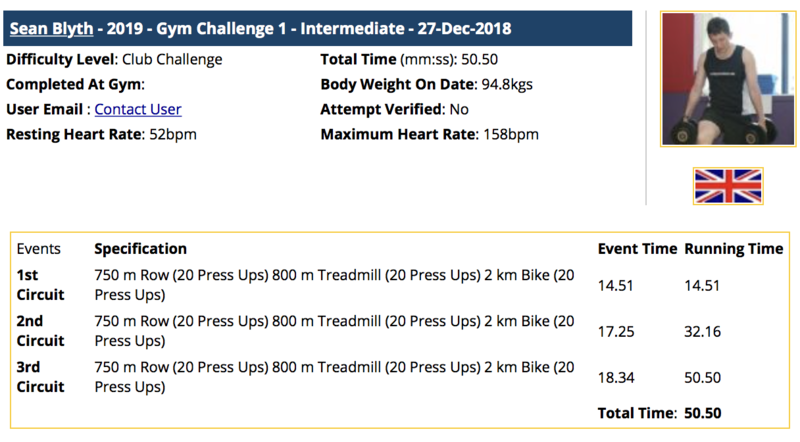 There were no recovery breaks in this circuit (January Gym Challenge) because finding the WGC Gym Athlete is the hardest ask of all – if this is something you would like to train for , then please do get in contact. lets see what time I can get it down to. If you are new to the gym or if you are an experienced gym user, there can be nothing more frustrating then going to the gym and not having a purpose to train. That is why each month World Gym Challenge provides a ‘Gym Challenge’ . A Gym Challenge is not a WOD (Workout of the Day) A Gym Challenge is something you train towards at a fixed point (a future date) using all of the equipment that you have in a gym in various formats. That fixed point can be anything from up to a month away – or a year away . But training for it , is relentless , you will have fixed vision on trying to improve your time, your strength and your Cardio. Which means every time you go into the gym you are training for a reason, as you train towards bringing your time down and improving performance. 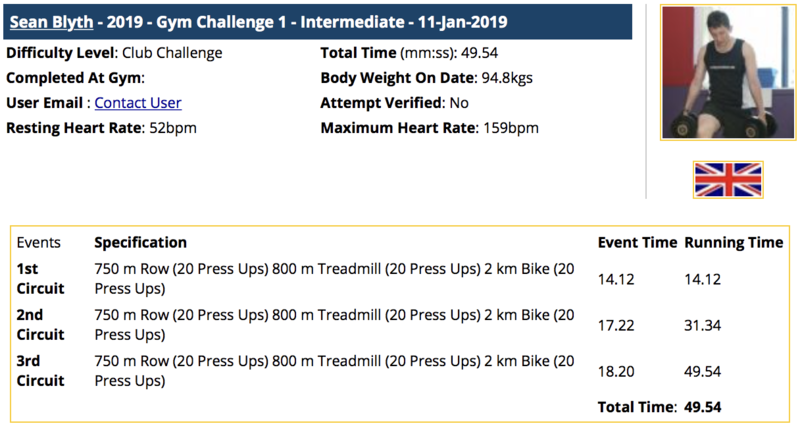 January 2019 – Gym Challenge from sean blyth on Vimeo. Intermediate – 3 rounds , as fast as you can with no recovery between rounds. Advanced – 5 rounds, as fast as you can , no recovery between rounds. What we are looking for in Intermediate and Advanced is the split time of each round and the differential in fatigue induced results. The fitter you are , the less variable there will be. And this is what we are aiming for as each Gym Challenge progresses. Create this for thew whole gym to take part in. 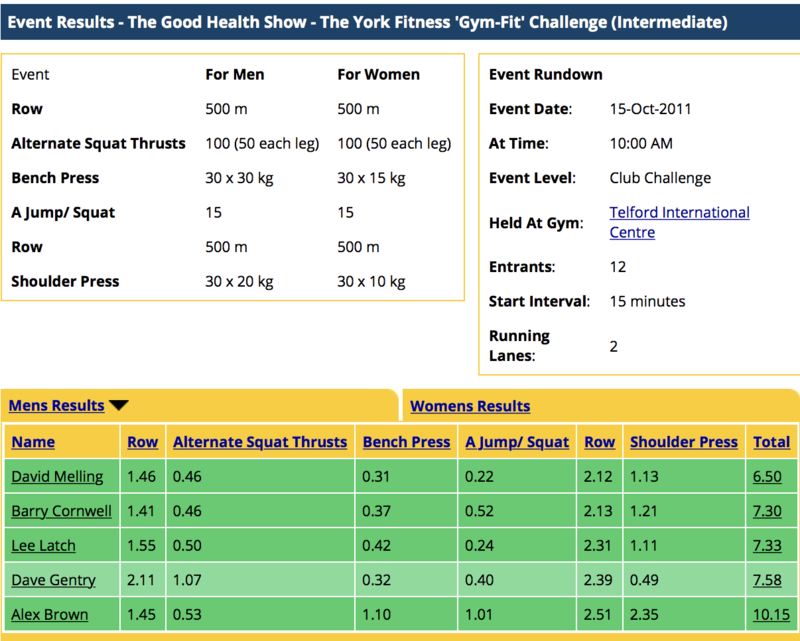 World Gym Challenge is unique in that it provides a complete database of results for its members. That means that annual records can be set and filed. If you would like a time based challenge set up for your gym, just please get in contact and that can be arranged – you don’t have to have a WGC Challenge you can create one of your choice. And so the search is on for Gym Athletes from all over the world. What is a Gym Challenge? 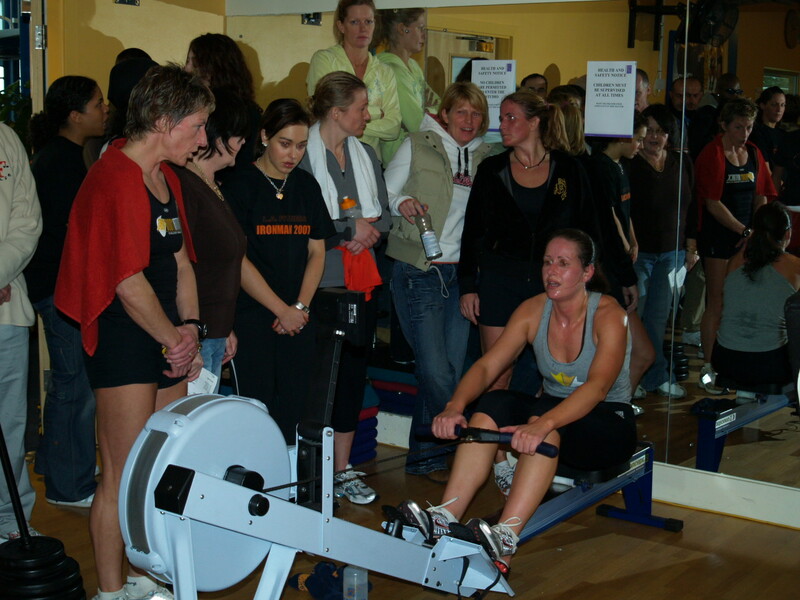 A Gym Challenge is a structured multi discipline race format event completed at your gym. It involves only the equipment you will find in a gym and is designed to challenge your aerobic and and anaearobic fitness. 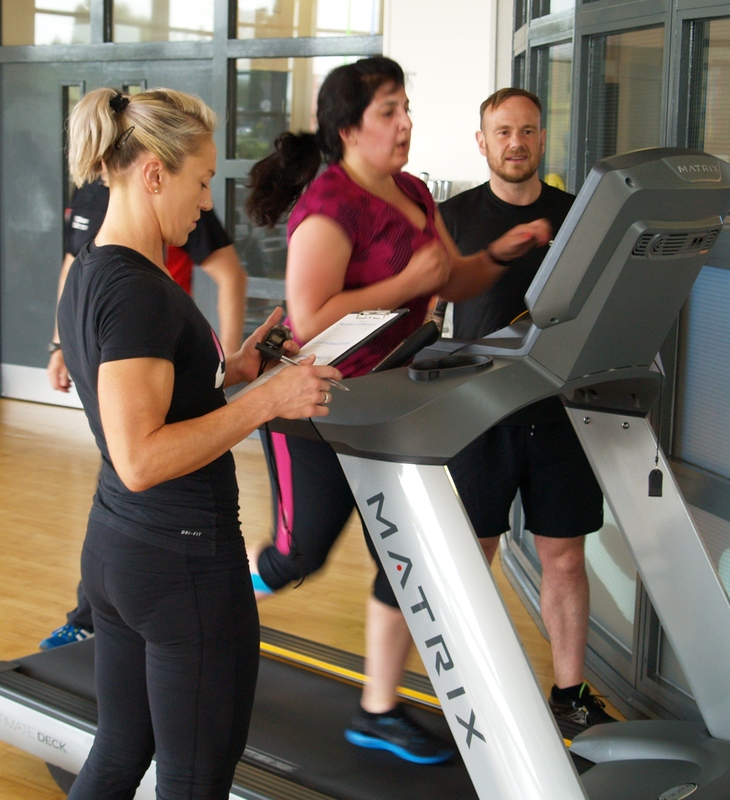 Seasoned gym members who have a sound knowledge of their fitness can take part. 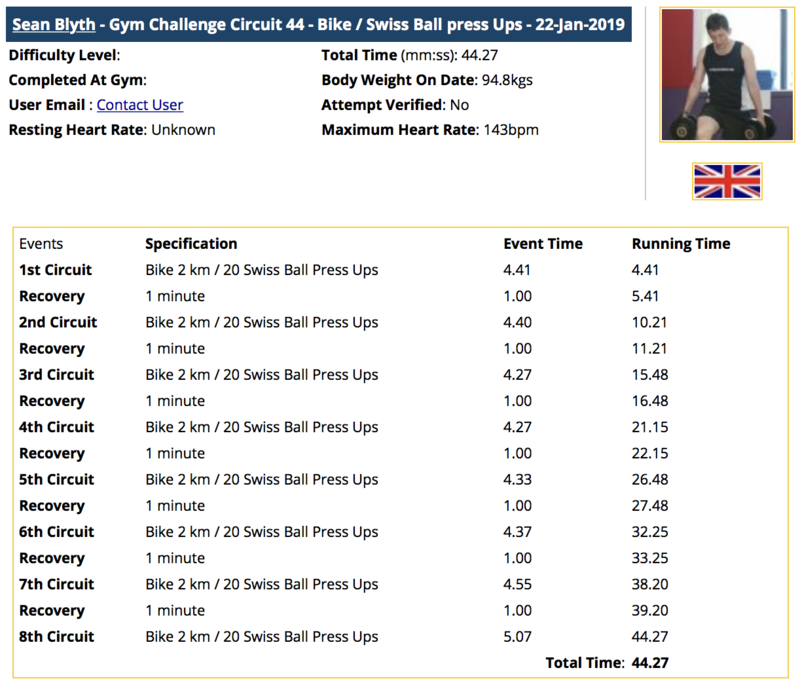 World Gym Challenge is looking for individuals of the right mind set and determination to complete 12 Gym Challenges and put their results online. The level of fitness required would be Intermediate and Advanced. Each challenge will feature equipment used on a gym. No Olympic lifting will be used. This is a first stage Gym Challenge concept. January and February are free and then after that a cost of £5.00 per challenge will be required. The only equipment you will need is use of a gym and a watch to time yourself. From January each month you will have focus point. You will have to complete a gym challenge. You will have to go to the gym and you will have to send your results to me via the Facebook group or by invite only to the Whats App Group. That in turn will give you one years worth focus, motivation and a goal each month to achieve. I will enter your results into gym leader boards, which will display the split timings for each of the disciplines and put them all into personal files in your World Gym Challenge data files. The group that will run these challenges is a personal Whats App group by invite only and the Facebook group. The Facebook group will be the driving Force of this concept and the community is expected to give encouragement, training tips and banter. 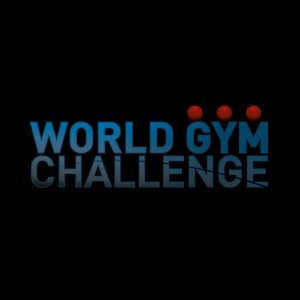 Please contact info@worldgymchallenge.com for further information. World Gym Challenge – A new chapter in your training. 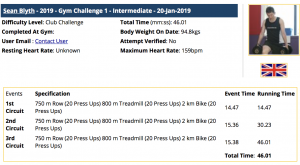 World Gym Challenge – What is it ? I guess it’s easier to explain what it is not in the modern age. It is not an app. An app is used for you in this industry to go into a gym and use it for personal goal setting. The difference between an app and World Gym Challenge is that WGC is a sport. A sport for gyms and this is the crucial difference. 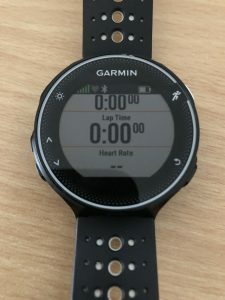 The average gym member will not wear a watch with a sports timer on their wrist and so most time based challenges are a not starter for them, so lets just rule out those who do not have a sports timing device on their wrist as well. You cannot take part effectively if you are timing yourself on a mobile. It’s too fiddly and you are likely to become beyond frustrated. So lets figure out what World Gym Challenge is then! 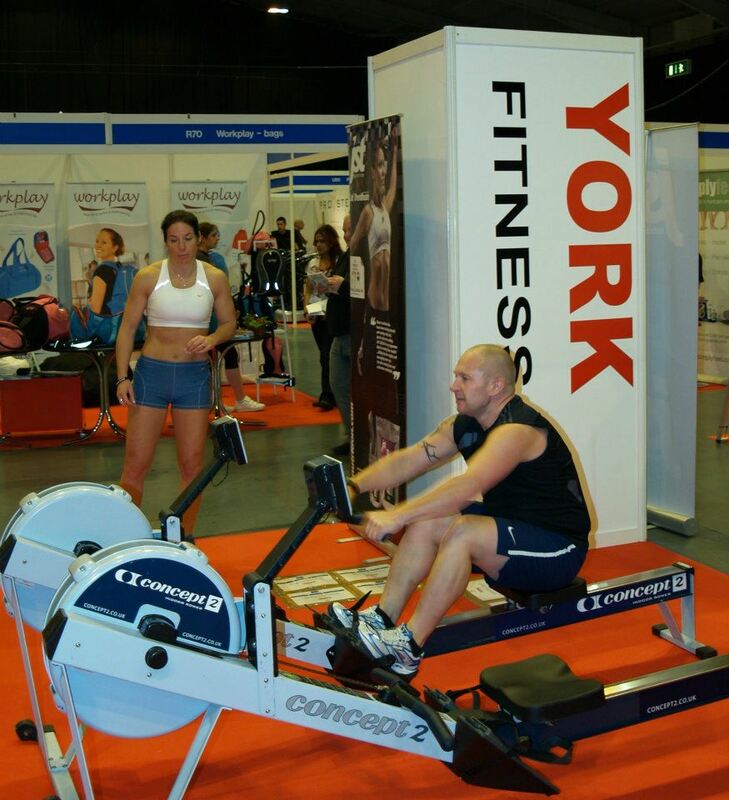 World Gym Challenge is a gym challenge first and foremost. As incredible as it may seem, most modern day gyms do not engage their members into some sort of sporting challenge based on the equipment they supply. There are a number of reasons for this , but predominately the overriding point being that gyms just do not have the know how, nor do they possess the staff qualified to create the challenges, or implement them into a structured event. That is not to say that the staff in gyms are not qualified in personal training or gym instruction, its just that their level of competence is based on individual members for personal gain – a client. Gym Sport , is mainly conducted outside of those circles. The average gym athlete is highly motivated and has been training in a gym for a number of years. They rarely if ever use the services of a personal trainer. Ironically personal trainers make very good gym athletes as they know the protocols to engage in methods of training. So you should by now be getting the picture – an individual who is highly motivated. Above average fitness and finding the urge to train for something that they find in the place they train at – hence the creation of Gym Sport. And this is where the problem lies – Gyms do not as a whole cater for that demographic. There is no money in it for them, so why waste the time to put something on that is rarely used. And then we see the what happens when gyms just ignored those people – CrossFit was allowed to emerge and become the driving force in Fitness. And yet the infrastructure was in place for Gym Sport to be the driving force in events. All those people who liked to be challenged left their gyms in the their droves – the inspirational , motivated and very fit types, left and joined Boxes from all over the world. And the rest is history shall we say. But Gym Sport is not CrossFit – Its so far removed from CF that it hardly shares any comparison. Gym Sport basis for evolvement is EFR – whats that you ask ? EFR is Equal Fitness Racing, you race somebody of equal fitness to you , whether you are super fit , or juts somebody who is starting out. EFR is based on split timing of segments of racing that form the core structure for Gym Sport. Basically if you know your own training regime and can implement that into a race program, then you are on the way to being a gym athlete. A lot of people are out there forming their own foundational building blocks to forming a sport and there is a danger of saturation when the financial rewards start to materialise and the cracks in solid companies that were first on board to create sport in fitness can develop. It really boils down to the separation of key strategic start ups and who will last the distance when the injection of major capital funding decides to dominate the fitness arena. World Gym Challenge has been sitting in the shadows watching all sorts of events, sports and competitions , mainly based on apps being launched into the modern world , but in the past twelve years or so of its conception, training in a gym has changed little . Predominantly there are supply chains of equipment to gyms, who mainly feature the Treadmill , Bike and Rower as its core product and World Gym Challenge capitalises on using these three multi functional pieces of equipment along with bodyweight exercises and non Olympic Lifting lifts into their regime of training. We are not CrossFit , we have no intention of being associated with CrossFit and the market of existing gyms is our bases for partners who would like to tray and create that spark in the gym for their members to train towards events that when consistently are competed will form the basis of sport recognition in a gym. So as a pre cursor to changing skills for training adapt to modern times, so does the need to change the existing World Gym Challenge to a new challenge. We did this , based on the three changes to make Gym Sport more available and non intrusive and disruptive to existing gyms. Gym Challenges are created so that members can compete during their normal training plans and then focus on any event should the gym choose to set up its own. 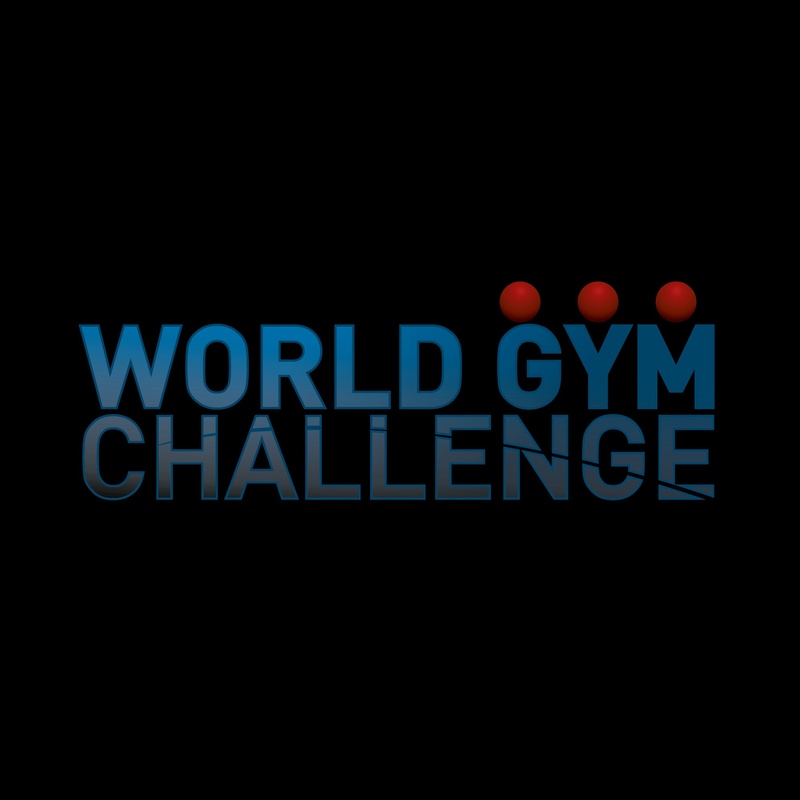 The new challenge will be announced soon , but you can see it after you have logged into World Gym Challenge in the folder named World Gym Challenge ! Have a look and see what you think !! Author adminPosted on 07/11/2018 Categories NewsTags Gym Sport, World Gym ChallengeLeave a comment on World Gym Challenge – A new chapter in your training.